Intelsat-29e is the second Boeing-built Epic-series satellite to suffer a propulsion issue, following Intelsat-33e in 2016. Credit: Boeing. Updated at 4:45 p.m. MT. COLORADO SPRINGS — Intelsat’s first Epic-series high-throughput satellite, Intelsat-29e, is drifting in orbit after back-to-back anomalies, forcing the company to shift customers to other spacecraft. Intelsat said April 10 that the propulsion system on the three-year-old satellite “experienced damage” — the cause of which it did not identify — resulting in a fuel leak. While attempting to restore services from the satellite, Intelsat said a second problem surfaced that resulted in a loss of communications with the satellite. 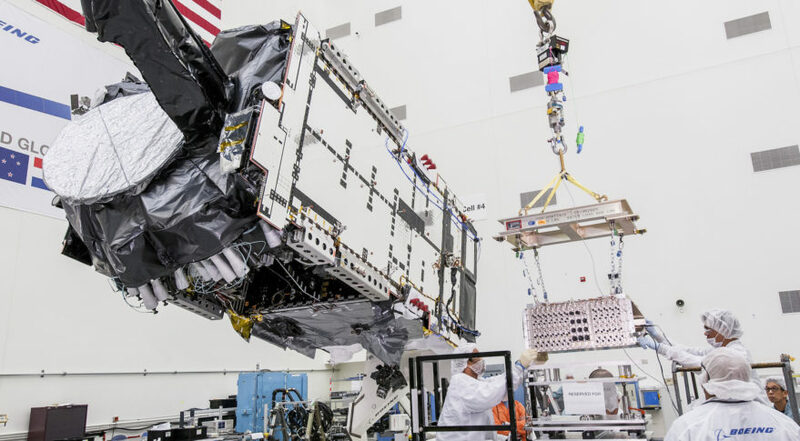 Intelsat said its connection with Intelsat-29e has been intermittent, and that it is working with Boeing, the manufacturer of the satellite, on restoring uninterrupted communications. The fuel leak occurred April 7, Intelsat said. Commercial space situational awareness company ExoAnalytic Solutions said its network of ground-based telescopes identified debris around Intelsat-29e on April 8. Doug Hendrix, ExoAnalytic’s chief executive, told SpaceNews two prominent pieces of debris were identified April 10, but that the company can’t determine it they are frozen fuel or something else. “What we’re confident in saying is they’ve had an anomaly; they have announced an anomaly. We believe that we have seen debris come off of the satellite,” he said at the 35th Space Symposium here. 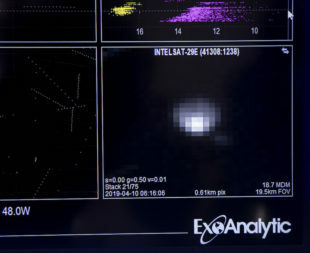 In a statement, ExoAnalytic said Intelsat 29e was “in a geostationary orbit at 50 [west] longitude until April 8, when it began tumbling and drifting to the east” along the geostationary arc where most telecom satellites reside. Intelsat-29e is the second Intelsat Epic satellite to experience a propulsion anomaly. In 2016, Intelsat-33e suffered a thruster issue that insurers estimated could shave 18 months off its design life. Boeing built five of the six Intelsat Epic satellites, and supplied the payload for Intelsat-32e, which used a bus from Airbus Defence and Space.